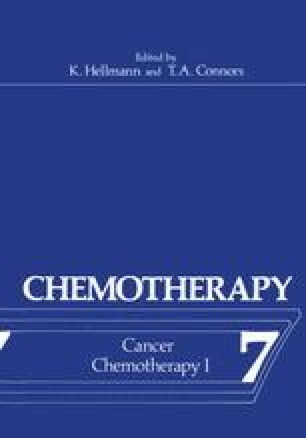 A series of transplantable mouse adenocarcinomas of the colon (MAC) have been developed from primary tumours induced by dimethyl-hydrazine. The tumours are all moderately to well differentiated and retain their histological appearance and growth characteristics through successive generations. The tumour lines were originally obtained by transplanting whole tumour nodules from the colons of donor mice subcutaneously, in syngeneic mice, and in this way we obtained several lines from a succession of transplant attempts. It is interesting to note the longer the donor animals were left following cessation of the dimethylhydrazine treatment the more successful were the attempts at obtaining transplantable lines. This is illustrated in Table 1 and probably reflects the progression toward greater malignancy with time observed by Haase et al., (1). A protocol for determining the chemosensitivity of the tumours has been developed, and to date eleven standard drugs have been tested, and from the results it would appear that the model has considerable disease specificity.